‘’The ripples of the pebble stone that was thrown into the water in 1989 have spread over a period of 30 years and become a force that affects all layers of society’‘ states Mr. Faruk Eczacıbaşı in his book, “Daha Yeni Başlıyor”. These ring shaped ripples are nothing but the inevitable transformation waves of the internet and related technologies brought to our society. In the book, it is stressed that we live in a transitional period which the old models that shape the lives of today’s senior generations lose their validity; on top of it, the new models have not yet been taken place. Each and every day, we observe that many systems that were established on strong foundations during the industry era has been questioned and even collapsed by new models. The necessity of change has begun to question our many behaviors that have been embedded to our DNA. In the book, the 3 must have components to develop new models are emphasized: Felixibility; to be prepared for the rapid change coming with exponential development, convergence; to avoid sticking past patterns of thought and to get rid of silos, networking; to take advantage of the advancing in communication technologies. Utilizing these three dimensions, we will be able to understand the future that is conceived to a great deal of uncertainities, prepare for them, and most importantly have the capability to look at these uncertainities through a different lens and see the big picture. Ray Kurzweil’s Law of Accelerating Returns states that once a technology becomes information-enabled (i.e. digital) it rides on the exponential curve of Moore’s Law. Therefore, digital technologies are improving exponentially and becoming accessible to an increasing number of people globally. This enables new ways of thinking and gives rise to new solutions to problems many didn’t even know existed. When “new thinking” makes an industry obsolete, it also eliminates an entire set of problems in a society. This is nothing but the definition of disruption. The exponential disruption affects different layers of our society in different paces and magnitudes. The layers of academy, politics, finance, economy, entrepreneurship, family concept all have their own dimensions and paces of perception and conductivity of this transformation. For example, look at the rate of change how the private companies such as Amazon and Google are managed and scaled, isn’t it unbelievable? As Salim Ismail, Yuri van Geest, and Mike Malone have argued in their book ‘’Exponential Organizations’’, that in the past five years, the business world has seen the birth of a new breed of company—the Exponential Organization—that has revolutionized how a company can accelerate its growth by using technology. A CxO can eliminate the incremental, linear way traditional companies get bigger, leveraging assets like community, big data, algorithms, and new technology into achieving performance benchmarks ten times better than its peers. As I have been a technology entrepreneur for the last 6 years, working on digitizing and disrupting energy&utility industry at Reengen, I witnessed enough to elaborate more in entrepreneurship dimension of above phenomenal transformation. I, in my own way, will try to express my impressions on how Silicon Valley responds to these exponential transformation waves in entrepreneurship domain. 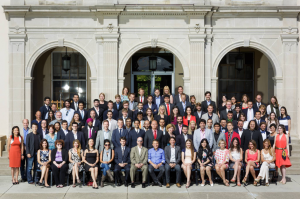 Couple of years ago, I spent an entire year in Silicon Valley and completed 4-month Graduate Studies Program of Singularity University (SU). SU is located at the very heart of Silicon Valley, inside the campus of NASA’s Ames Research Park. Backed by Google and NASA, SU devoted itself to educate, empower, and inspire leaders to leverage exponential technologies to solve humanity’s grand challenges. Graduate Studies Program particularly helps future-focused entrepreneurs transform radical ideas into tangible impact on a global scale. It empowers and inspires entrepreneurs to solve the world’s biggest challenges in energy, healthcare, transportation, food etc. 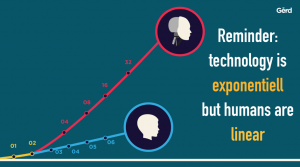 using exponential technologies and in return impact the lives of a billion people. The program is also structured to scale startups into global businesses by providing mentorship, acceleration and venture funding. William Gibson once stated: “The future is already here — it’s just not very evenly distributed.” During my time at Singularity University, I had the chance to witness that unevenly distributed future. 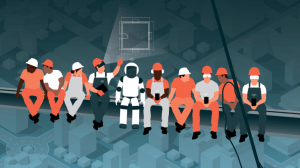 From astreoid mining companies to brain-computer interface ventures expanding human intelligence to cloud via merging our brain with AI, these moonshot companies convinced me that when this distribution is more even, it will shift and create massive opportunities as well as new ethical concerns and uncertainities in its wake. One thing the SU faculty wanted us to learn and experience by heart is being an entrepreneur today is vastly different than it was 20 years ago. Today, each of us has access to more capital, more technological tools, more information, more talent, and more computational power than the CEOs of the world’s biggest companies did just two decades ago. It is so important that I want to re-visit the concept of convergence. A common mistake we all tend to make over and over again is to look at the world of technology in isolation and silos. We see AI and consider it as a thing in and of itself. We hear about blockchain and we directly think about its impact in finance sector via cryptocurriencies. We observe autonomous vehicles and think about what this will mean for car manufacturers. We watch the latest Boston Dynamics robot doing parkour and consider the implications their progress will have on manufacturing. The more interesting and insightful question to ask is: What aspects will this technology enable in other technologies and what other domains will change? Most technologies drive very specific change in somewhat narrow industries (autonomous vehicle technologies combined with the E-vehicles will likely dramatically change the automobile landscape) and radiate into many other sectors, industries and technologies. Autonomous vehicles will change the way we think and build cities which in turn will dramatically alter long-held real estate practices, will lead to fewer car accidents and thus influence the insurance industry as well as eradicate most car repair shops and redefine what the word “commute” means. And this is just scratching the surface. I am not even mentioning how electric vehicle energy storage batteries will transform how the Electricity grid is operated. 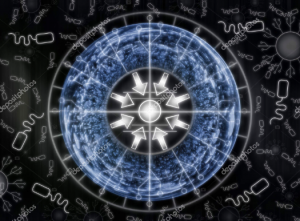 Technologies like AI, blockchain or quantum computing are mostly horizontal enablers – which will influence, change and disrupt countless industries and adjacent technologies. Whenever you encounter a new technology, ask yourself not only what the direct implications are but what else will change due to the convergence of technologies. New products, services, and whole industries are born in the newly formed gaps resulting from convergence. As if I haven’t put it enough times, I want to mention about exponentials. We know that technology moves on exponentials curves, thus you have to build your company today for the reality which will exist when your product hits the market tomorrow. The same amount of change which has happened in the 70 years from 1900 to 1970 has happened in the 30 years from 1970 to 2000. The same amount of change has happened in the ten years from 2000 to 2010. And the same amount of change has happened in the 4 years from 2010 to 2014. Something which might be prohibitively expensive to do today can be done cheaply tomorrow. Something which requires large amounts of compute power might not be feasible today but can easily run on tomorrow’s computer. When building your company focus on anticipating these trends and build with their consequences in mind. Otherwise, your stuff will be outdated the moment it hits the market. Dematerialized: Exponential technology turns tangible “things” into digital apps. We no longer carry around GPS equipment — it’s an app on our phone. 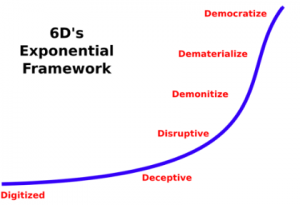 Exponential entrepreneurs use the 6D’s as a technological road map to predict where technologies are going and when to capitalize on the opportunities. This cheatsheet framework gives them an unfair advantage over competitors. Gradually and then suddenly might be one of the most profound insights into how disruption happens today: First you cannot see nor feel it. The first smartphones were undoubtedly impressive, but they did not kick a massive dent into the universe – until the iPhone and later Android phones came out and suddenly shifted the equation. It is a profound lesson for everyone who is in a legacy business and a good motivator for those of us who are ahead of the curve. In 1996, Kodak was at the top of its game, with a market cap of over $28 billion and 140,000 employees. Fast forward to 2012, when Kodak filed for bankruptcy – disrupted by the very technology that they invented and subsequently ignored. In that same year, another company in the digital imagery business, Instagram, was acquired by Facebook for $1 billion, but they had just 13 employees. This phenomena is called the “Kodak Moment”. Do not experience the ‘’Kodak Moment’’ by underestimating the future. 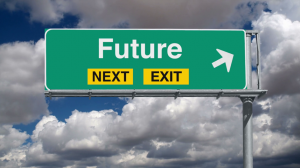 It might sound contradictory but sometimes the future comes slower than you think. It is a story which repeats itself over and over again – with new technologies, it is typically not the first to market to take the crown, but the one who gets the timing just right – the moment when all the relevant factors come together and create the perfect storm. A good example where way too many companies jumped head first into a new technology; way too early and will likely flame out is pretty much anything blockchain and crypto-related. We got to wait fellow blockchain entrepreneurs, it takes years. 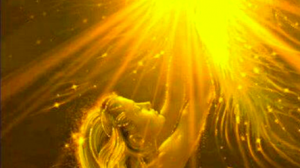 During our SU program, one other concept that we were exposed to in daily life is ‘abundance’. Exponential entrepreneurs should know that technology is a force that transforms things from scarcity to abundance. Technology is creating a world of abundance in almost every major arena, including energy, knowledge, transportation, computation, access to education and access to healthcare. Transportation is demonetizing 10x because of electric autonomous cars and ride sharing apps such as Uber. 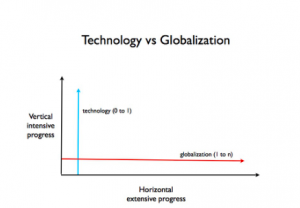 In his book “Zero to One”, Peter Thiel explores a simple and yet incredible powerful framework: Horizontal progress means copying things that work — going from 1 to n. Horizontal progress is easy as we already know how the future will look like. Vertical (or intensive) progress means doing new things — going from 0 to 1. Vertical progress is hard as you’re doing new things. Things that are not done before. Vertical progress, going from 0 to 1, is where the real opportunities lie. It’s where the billion dollar companies are made. It’s where exponential entrepreneurs should play. All you have to do is to find the right industry, leverage ever more powerful and cheaper hardware, software and sensors — and you have the potential to unseat an industry! Exponential entrepreneurs have a Massively Transformative Purpose (MTP) that drives them to power through hardship and attracts the best talent to join them. An MTP is a “highly aspirational tagline” for a group, company, or organization. It is a huge purpose statement that serves a deeply unifying purpose. 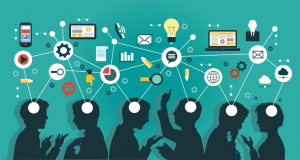 It brings like-minded people together and motivates organizations to keep breeding success. MTPs induce two important pre-requisites for success: meaning and motivation. An MTP engages people with a common cause to work together, encourages them to follow their passion, and most importantly, solves a problem that people care about. An MTP stresses that money is not the primary driver: passion is. In other words, MTPs give people purpose and make work meaningful. US Navy Seal doctrine says: ‘’The magnitude of the challenge multiplied by the intensity of the attack equals your rate of growth.’’ So go for 10x instead of 10%. Even if you fail, you learn and grow more. SpaceX is a great example of a company with an MTP: humans must become a multi-planetary species. Amazon: become Earth’s most consumer-centric company. Google: organize the world’s information. Exponential entrepreneurs should build something they deeply believe in. Something which makes things better. Something which challenges and grows them. And keep challenging the common wisdom and the status quo. They need to ask themselves this question: ‘’What will be different in the World in a positive way if I succeed?’’ They should build their company as if they were building it for the next 100 years – while, at the same time, also building it like they would be selling it tomorrow. It is an interesting and valuable thought experiment: When you force yourself to think about the long-term, you start making decisions differently. You build a strong foundation with a focus on longevity and become much more durable to short-term notions. People typically try to optimize existing systems. They work on making a process or product better. The problem with making things just better is that you’re looking at marginal improvements — the 10% improvement. The problem is that when you look at marginal enhancements you constrain yourself pretty severely. This is compounded by the fact that nowadays most systems are already highly optimized — getting to a 10% gain is hard. On the other hand, when you allow yourself to think about making things exponentially better — 10x versus 10% — you force yourself to scrap all existing assumptions, truly understand the problem and solve for it from the ground up. I many ways it’s easier to think in 10x change instead of 10% improvements. Maybe not initially as it forces you to leave the well known path; once you left the comfort zone and allow yourself to be creative and imaginative, it becomes so much easier. Access to startup capital is no longer scarce. Crowdfunding has grown into an opportunity worth multi-tens-of-billions of dollars, providing more capital to today’s startup game than any time ever in human history. There are proven ways to run a Kickstarter or Indiegogo campaign; for exponential entrepreneurs, these capabilities are second nature. All you need to know is exactly what you want. If you do, most times, the crowd can do the rest. For the first time in human history, individuals/people/communities have the same innovation power as large companies, and even nation states. You can rapidly prototype a product, produce it in China, ship it around the world, use the same software infrastructure the largest companies on this planet use, tap into a deep pool of talent in every profession, reach, market and sell to billions of people. All nearly instantaneously, for free or very little money. This surplus of possibilities comes at a price though: The quality of your idea matters more than ever. As only the best, most insightful, brightest, meaningful ideas survive the brutal fight for survival in a world of abundance. 10) You Better Be Fast. Speed. It’s all you have. I will give you a secret: most likely your idea isn’t unique. Your technology is good, not amazing. You are surrounded by numerous companies doing similar things. They are bigger and better financed. Google, Facebook, Apple or Microsoft could do what you do. But all that doesn’t matter. You have a small team and you are fast. You don’t have meetings — you shout stuff across the room. You talk to your customers daily. In the time it takes any of your big competitors to figure out the internal reporting structure of the project, you released version 2.1 of your product. Speed is your advantage. Most companies have a tendency to add people to problems they want to solve quicker. Normally this results in the project slowing down. The reasons are mainly centered around the notion of increased necessity for communication and coordination. When you do a startup you are at a huge advantage over even the largest competitors: You are fast. You can cut corners. The market doesn’t have a set of expectations which it expects you to fulfill. You can play by your own rules. The last thing you want to do is to slow down. In most cases speed is all you have. Speaking of tribes, I think I have found mine recently. I am proudly part of the great team that has launched a new initiative called Beginning Node (BN), an affiliation of Turkish Informatics Foundation. BN is a platform that empowers individuals by creating encounters with people from different disciplines who share their vision and by connecting them to the tremendous potential of exponentially growing ideas. 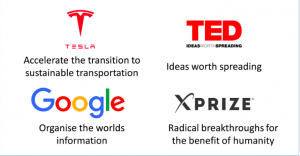 In a way, it is a network as a science platform acting as a hub for all organizations and go-to source for emerging disruptive establishments. It’s a platform for formulating models to solve the problems generated and spread globally by the Internet. 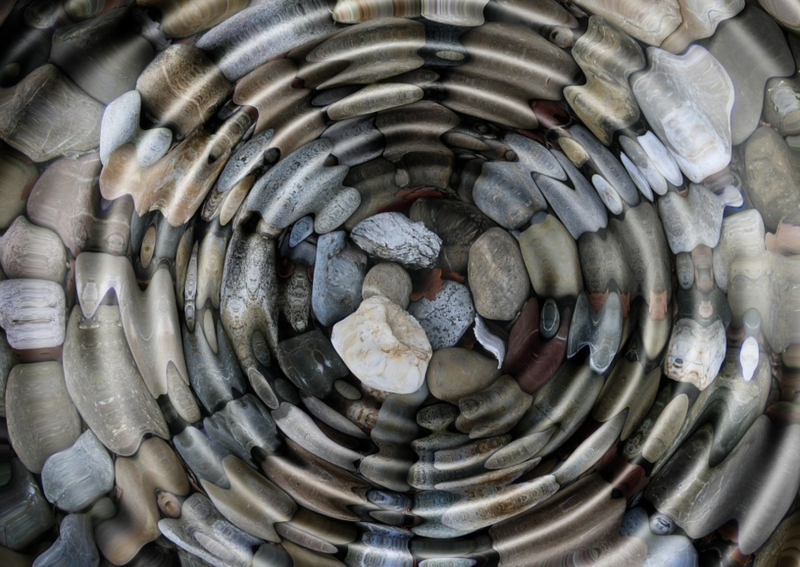 Remember the ripples of pebble stone and the exponential waves? Here we are trying to enable and empower the society to surf on these waves instead of being drawned out. We believe that it’s not just our duty to try to solve the problems of the new world and the uncertainties of its future but also our debt to future generations.